Even Poor Countries End Up Wasting Tons Of Food : Goats and Soda It's not just a developed world problem. One of the authors of Food Foolish talks about the problem in low-income countries, where food often decays in the fields or spoils on the way to market. A fruit dealer in the Kashmir region of India separates rotten apples from freshly harvested apples. As much as half of the food grown or produced in the developing world simply never makes it to market. And that loss is costing billions of dollars and blighting countless lives. That's one of the issues raised in the book Food Foolish: The Hidden Connection Between Food Waste, Hunger and Climate Change by John Mandyck and Eric Schultz. Mandyck, who's the chief sustainability officer at United Technologies Building & Industrial Systems, and Schultz detail the causes and consequences of the $1 trillion mountain of food that is wasted around the world each year. In the developing world, says Mandyck, some fixes can be as simple as getting farmers in places like Kenya to use crates instead of burlap bags to transport their tomatoes to prevent them from bruising on the way to market. In Afghanistan, a U.N. Food and Agriculture Organization project to provide farmers with grain silos, made by local tinsmiths, reduced losses to insects and rot from 20 percent to less than 2 percent. In Nigeria, a program that provided the millions of small farms with access to loans, seeds, fertilizer, warehouses and transportation saw maize yields triple and put money in the pockets of farmers. We spoke to Mandyck about the problem of food waste. The interview has been edited for length and clarity. How big a problem is food waste worldwide? The impact of food waste on hunger, climate change, natural resources and food security is enormous. More than 1 billion metric tons of food is lost or wasted each year, never making it from the farm to fork. To put that into perspective, imagine 1.3 billion healthy Indian elephants standing on top of each other in one pile. That's the size of the mountain of food going to waste each year — and all of it perfectly good food. Meanwhile, more than 800 million people are chronically hungry — a population equivalent to the United States and European Union combined. Food waste also has a devastating impact on the environment, from the water wasted to grow the food we never eat to greenhouse gas emissions. 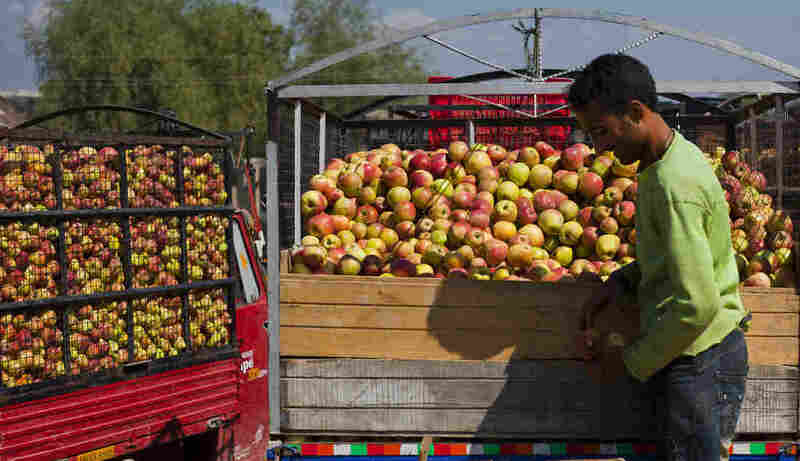 The U.N.'s new goals talk about wiping out hunger by 2030. Is that possible? Some estimates show that we will need to increase our global food production by 70 percent to meet the needs of our growing population. It doesn't make sense to continue with the current paradigm, which is to grow more — and throw more away — to try to feed more people. Instead, we should implement readily available strategies to avoid food loss. Even saving a portion of what is wasted can have a dramatic impact on reducing hunger, malnutrition, poverty, political instability, water shortages and carbon emissions. You mention in your book that the monetary cost of all this wasted food exceeds $1 trillion every year. What about the hidden costs? If you look at food waste as an environmental problem you'll find that the energy we put into growing this food that nobody ever eats contributes 3.3 billion metric tons of annual carbon dioxide every year. That's including fuel for tractors used for planting and harvest, electricity for water pumps in the field, the power for processing and packaging facilities and more. Viewed another way, if food waste were a country by itself, it would be the third largest emitter of greenhouse gases behind China and the United States. Food is essential to life. Why are we so inefficient at getting it from farm to table? There are two very different kinds of problems associated with food loss and waste. One is structurally based: bad weather, poor roads, improper packaging and an inadequate refrigeration distribution system. Many of these issues can be addressed through careful planning, political will and sufficient investment. Then there are problems that are economic and culturally based. Food too expensive to be purchased will rot in the warehouse. Food too unprofitable to harvest will be lost in the field. Meal servings that are twice what a person can eat will be partially discarded. A perfectly edible apple with harmless spots or a misshapen carrot might be tossed in a landfill. The elements of supply and demand, pricing, tradition and culture all play an important role in food loss and waste. How is food wasted in the developing world? Often in developing countries, food decays in fields or farms before harvest or else spoils while it's being transported. In fact, food loss at the production and distribution level accounts for two-thirds of global food waste. Being able to keep fresh food chilled during storage and transport would make a huge difference, but many places do not yet have the technology, infrastructure or the money to set up a sophisticated "cold chain" — the network of refrigerated trucks and storage facilities you need to bring fresh food from the farm to the market. If developing countries had the same level of refrigeration for the transportation and storage of food as developed countries, approximately one-quarter of food loss would be avoided. For example, India produces 28 percent of the world's bananas yet represents just 0.3 percent of all internationally traded bananas. With an improved cold chain, the number of bananas exported could grow from 4,000 to 190,000 containers, providing an additional 95,000 jobs and benefiting as many as 34,600 smallholder farms. That would make quite an impact on India's farmers and economy.